The Prestages at the 2015 Menscer Cup ceremony. 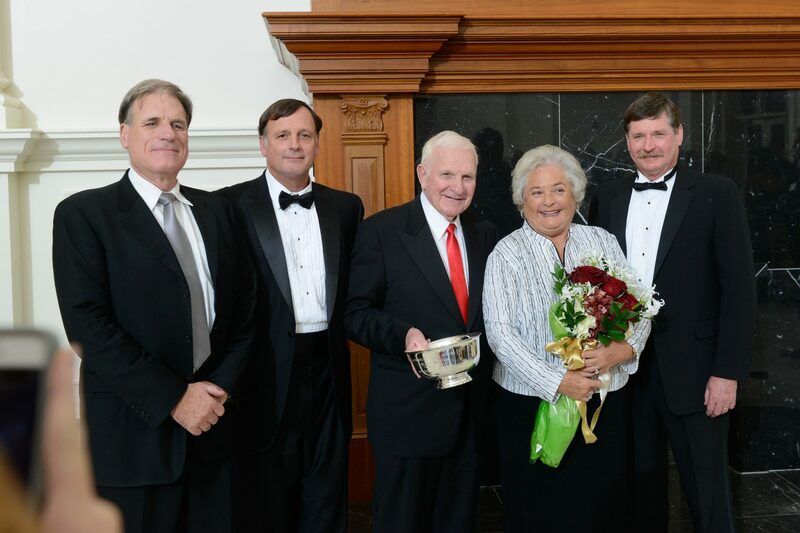 William H. “Bill” Prestage, the founder, owner and president of Clinton-based Prestage Farms Inc., has been recognized with the 2015 Menscer Cup, the North Carolina State University Foundation’s highest award for philanthropy, dedication and leadership on behalf of the university. Prestage – whose family’s contributions to NC State include a transformational gift to the poultry science department in 2012 – received the honor Nov. 5 during a dinner ceremony in the grand reception room at Park Alumni Center. In accepting the Menscer Cup from Chancellor Randy Woodson and Ira J. “Jerry” Jackson III, chair of the foundation’s board of directors, Prestage recalled the early days of building his family business. Faculty and staff from NC State’s colleges of agriculture and life science, veterinary medicine and engineering have provided critical expertise and support, he said, to what is now one of the nation’s leading producers of pork and poultry with divisions in five states. Prestage was joined at the event by his wife, Marsha, whom he called “the brains behind this whole business.” The couple moved south from Michigan in the 1960s for opportunities in the agriculture industry and eventually started Prestage Farms in 1983. The NC State University Foundation created the Menscer Cup in 1997 to honor Darrell and Carolyn Menscer for “exemplary leadership of advancement efforts.” While chairing the foundation and co-chairing the Campaign for NC State Students, Darrell Menscer led efforts in university fundraising, endowment management and alumni service. Each year, the cup goes to an individual or family that has made a major impact through their “above and beyond” service and generosity. Bill Prestage has chaired the NC Agricultural Foundation Board and served on the Vet Med Foundation Board, and in 2006 he received the FFA Premier Partner Award. 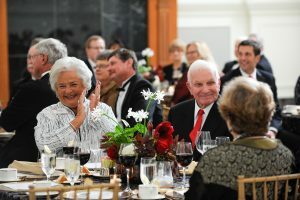 He and Marsha are members of NC State’s Alexander Quarles Holladay Lifetime Giving Society and the Chancellor’s Circle. Their $10 million gift essentially assured the survival of what is now known as the Prestage Family Department of Poultry Science. NC State is among only six universities in the United States with departments dedicated to poultry science; two decades ago, there were 14. The department provides critical and innovative teaching, research and extension activities that address both opportunities and needs, bolstering North Carolina’s number-one agricultural commodity, which is worth billions of dollars each year to the state’s economy. Its faculty members cover all aspects of poultry production, from farm to fork, and the department’s extensive collaborative work includes some $14 million in active grants. In addition to addressing critical scientific and technical issues related directly to poultry, the work impacts other areas. Avian stem cells, for example, have human health applications in vaccines and the avian model of ovarian cancer may lead to insights about the human disease. “The Prestage Family Department of Poultry Science will continue to grow and excel, making a difference for students, and for the industry, for years to come,” Woodson said. In addition to support of the poultry science department and to a distinguished professorship within the department, which officials expect to fill in the next few months, the Prestage family has generously supported the College of Veterinary Medicine; the FFA Foundation; the N.C. Agricultural Foundation’s Nickels for Know-How program; and the Wolfpack Club. And this month, for the fourth year, Prestage Farms is partnering with the university’s Annual Giving office to help encourage the next generation of NC State benefactors. Through this challenge program, as Annual Giving adds younger alumni donors, the company donates hundreds of turkeys to the Food Bank of Central and Eastern North Carolina to feed families in need. Woodson also thanked Bill Prestage for his time and counsel behind the scenes, and for Prestage Farms’ internship program. “Our students learn about the industry, and they learn about hard work, quality, respect and integrity, as they see the way that the Prestages relate to hundreds of employees and growers,” the chancellor said. A member of the NC Poultry Hall of Fame, Bill Prestage has served in leadership roles such as president of the National Turkey Federation, and he is a recipient of a Hall of Fame Award from the NC Pork Council. He has been a director of NC Natural Gas Corporation and of Smithfield Foods. In addition to their generosity to NC State, Bill and Marsha Prestage support many causes and programs in eastern North Carolina, including Boy Scouts of America, Graves Memorial Presbyterian Church, American Cancer Society, United Way, 4-H, Ducks Unlimited, Sampson Regional Medical Center Foundation, Sampson County Community College, community arts and theater, county agricultural fair programs and more. The couple’s family is also involved at NC State. Their three sons, and one daughter-in-law, attended the university, grandson Zach is an alumnus and three other grandchildren are currently enrolled. Son Ron currently serves on the university’s Board of Trustees, while son Scott is on the Agricultural Foundation Board and the Agricultural Research Foundation Board, and son John has served on the Vet Med Foundation Board. We are fortunate to count the Prestage family among the Wolfpack’s top supporters. In addition to the Prestage family and NC State Foundation board members, guests at the Menscer Cup event included members of the Board of Governors and Board of Trustees, former cup recipients, university deans and executive officers, students and faculty from the poultry science program, and other friends of NC State. 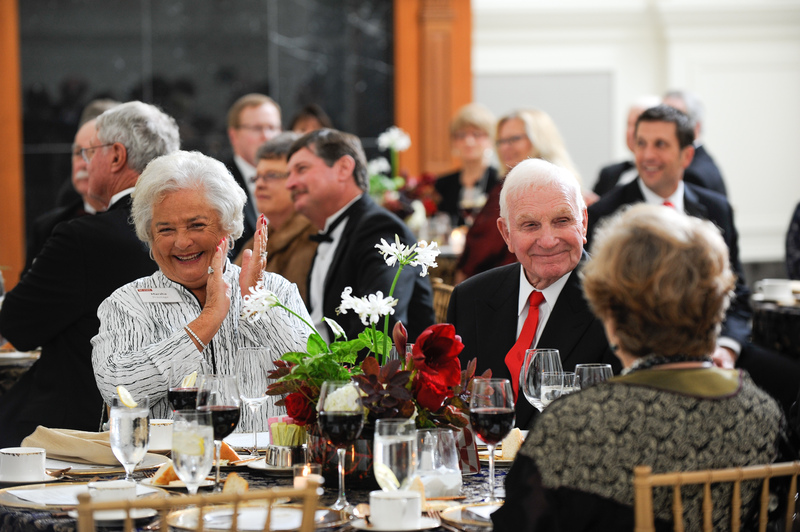 The chancellor thanked everyone for their contributions to the university’s strong momentum, including the growth of its endowment to nearly $1 billion. A list of past Menscer Cup recipients can be found here.